Randall Grahm, of Bonny Doon Vineyard in Santa Cruz, is working on a revolutionary project to make a vin de terroir from hybrid grapes. Grahm (pictured) is looking to create a diverse population of varieties, each genetically distinctive from the other, by planting an eight-hectare “mother block” vineyard at his San Juan Bautista Central Coast estate with Ribolla, Petite Arvine, Petit Manseng, Grüner Veltliner, Furmint and other as yet undetermined grape varieties. Eschewing the normal practice of planting clonal selections of vines reproduced by grafting, he will grow his grapes from seedlings rather than cuttings. “The basic idea is an exercise to find out if it’s possible to produce something like a vin de terroir in a relatively short period of time by employing techniques to accentuate the signature of the site itself,” said Grahm. The initial vineyard will be actively cross-pollinated, either by hand, or by growing the vines in close proximity. 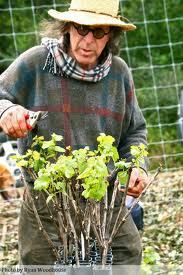 He will then plant seeds from grapes spawned in the mother block vineyard into a new, larger vineyard. These will be grown into new own-rooted vines and dry-farmed. Grahm admits the project will take generations, “but I’m hoping there will be intermittent positive reinforcement,” he added.